Vernon’s compositions suspend elements of abstraction, architecture, figuration, and landscape in a cohesive visual expression of the irrepresentable, the unknown, and the metaphysical. By applying recognizable hints of terrain, gradients, and form, Oliver creates subtle cues that invoke grounding familiarity while demonstrating the freedom to push abstraction and obscurity. 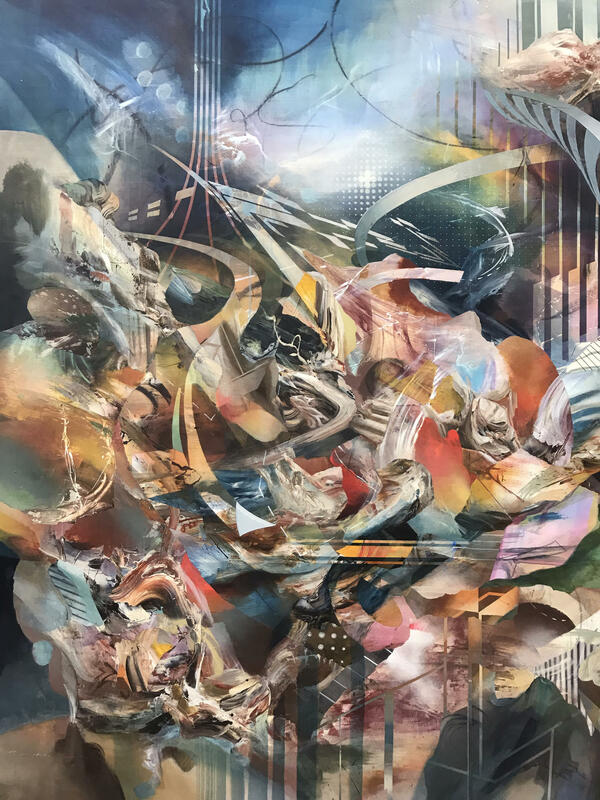 His work challenges preconceived notions of perception, space, and structure as he methodically stretches, warps, anddeconstructs traditional compositions. The oscillation between calmness/calamity, weird/wonderful, and machinery/mother nature evoke a pulsating energy that gives life to every one of Oliver Vernon’s pieces. Oliver Vernon was born in New York in 1972. He received his BFA from Parsons School of Design in 1995, and currently lives and works in Brooklyn. He has exhibited his work in cities all across the United States including New York, Los Angeles, Seattle, San Francisco, San Diego, and Chicago, and has also shown in London and Toronto. His work is part of numerous collections, including the Metropolitan Museum of Art. Visually, Brooklyn based artist Oliver Vernon’s paintings draw upon an incredibly varied pool of influences, from abstract expressionism, to post pop surrealism and the polished finish of figurative realism. Formally, his work is about the deconstruction, and hence the necessary reconstruction of visual space. From this central dichotomy stems many others: logic/illogic, physical/metaphysical, imprisonment/liberation. His paintings come to us, perhaps, as detailed snapshots of the few primordial milliseconds when the blueprint of the universe was being sculpted from the final throes of chaos. In this sense, anything goes. Each painting has it’s own set of rules, or rather the rules are being bent, broken and ultimately formed within each painting. Color, form, energy, architecture, good, evil, flesh and machine are lurking, never as physical entities, but as transient archetypes searching out their final places within the framework of the cosmos. Apart from this macro view, Oliver’s work can be seen at the micro level as well. We can view his paintings as representations of how the mind is formed from a foundation of thought, reason, and aesthetics, and how these entities are simultaneously at odds and interconnected.